Looking for a luxurious ski-in, ski-out mountain home in Park City? The Canyons Ski Resort in Park City, Utah is home to some wonderful ski homes for sale. Slopeside luxury homes, large acreage lots, and ski access townhomes are available for sale and offer a great place to own a second home or ski vacation property. The most sought after real estate at Canyons Resort is by far the stunning homes at The Colony at White Pine Canyon. The Colony is a private, gated community that offers the largest ski-in, ski-out homes and homesites in North America. Here you will find the most amazing ski homes in all of Park City. If you truly are looking for the ultimate dream ski home, you must consider The Colony! Real estate values at the Canyons have benefited well with the many recent ski resort improvements over the last few years. With their continued upgrading and expanding, Canyons was recently voted as a Top Ten ski resort by the reader's of SKI Magazine. Also the long awaited Canyons Golf Course is currenty under construction and should add even more value to the neighboring real estate communities. With new real estate developments, and the upgrades at the resort's base village, the Canyons Resort is quickly becoming it's own desired place to live and visit within the greater Park City community. 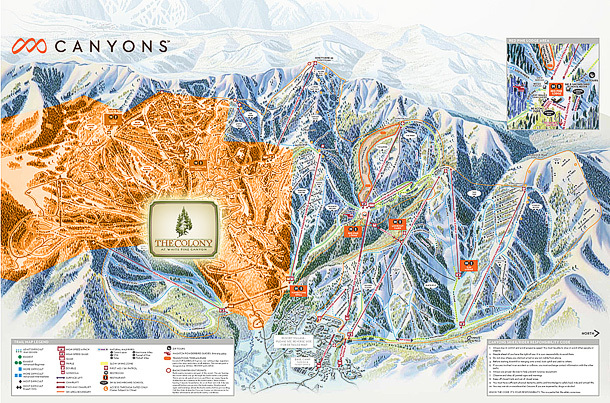 Read more about ski homes at The Canyons. Browse ski homes at The Canyons for sale below or contact Heather Peterson & Sean Matyja for more information about Park City real estate. Looking for a Particular Style of Home at The Canyons? For those who have to have it all, this award-winning 4,600-acre, private gated community is home to the largest ski-in/ski-out homesites in North America. Homesites in the Colony average 7 acres and only at The Colony do you have the opportunity to build your mountain dream together with a separate guest-house and accessory building on the ski slopes. The winning combination of natural beauty, size, privacy, terrific skiing from the front door has attracted some of the most discerning buyers from across the nation. The Colony ski-ranch is truly a four-season playground. When the snow melts, you have easy access to some of the best hiking and biking trails in Utah. The Colony at White Pine Canyon offers some of the finest homes in all of Park City and Deer Valley. On the above Canyons Resort Map, You can see just how large The Colony at White Pine Canyon is! The Colony is highlighted by the orange overly on the ski map. The Vintage on the Strand is a thoughtfully planned offering of elegant townhomes in an exceptional ski-in, ski-out location where you can enjoy the pleasures of home, blended with the excitement of living in a mountain wonderland. Designed by a team of Utah’s finest craftsmen, The Vintage on the Strand is a timeless retreat. Alpine European architecture with rustic stone weathered appointments and rough-sawn timbers compliment the natural surroundings. Gentle lighting and carefully chosen color schemes intensify the beauty of the outdoors. All units feature custom finish work, Wolfe appliances, specially made cabinets, granite countertops in the gourmet kitchen, with gas fireplaces and magnificent views of the valley and surrounding mountains and slopes. The Timbers is a small enclave of homes located adjacent to the base village of the Canyons Ski Resort, just above the well known Hyatt Escala Lodge. The Timbers offers ski-in, and ski-out access to the Canyons Resort for a much lower price than what you might find in other ski access communities such as The Colony at the Canyons, or any of the Deer Valley ski-in, ski-out neighborhoods. Here you'll find stunning homes custom built in a beautiful treed mountain environment. Homes range in pricing from around $3,000,000 to $5,500,000. The Timbers can be popular as the driving access is close and easy, and the community is tucked away in a private setting. Need More Info About homes for sale at Canyons Resort? Heather & Sean can help you with all of your Park City and Canyons Resort real estate needs. Call us at 1.435.640.2573 or contact us online for a free consultation.